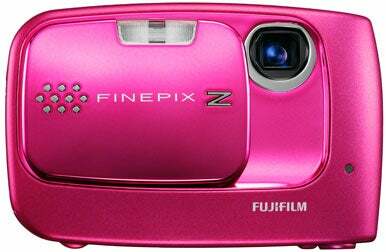 Fujifilm’s FinePix Z30 may look like a toy, but this fashion-first point-and-shoot camera (available in black, orange, pink, purple, and white) takes excellent photos. Still, you’re unlikely to gravitate toward this camera unless you’re a teenage girl, due to its youthful design and bright colors. In our lab jury evaluations, the 10-megapixel FinePix Z30 earned an overall Image Quality score of Very Good, with excellent sharpness and exposure levels. The FinePix Z30’s design, however, fell short on a number of counts: The placement of the lens in the top left corner of the camera’s faceplate means that your fingers may make unexpected cameo appearances in your photos; and its rubber buttons, basic features, and overall aesthetics won’t please everyone. Starting with the front of the camera, a shiny, button-bedecked faceplate protects the lens when the camera is powered off; sliding it to one side turns the camera on. The shutter button and the speaker are the only two items on the top of the camera. A slightly grainy 2.7-inch-diagonal LCD and ten rubber buttons handle all of the controls on the back of the FinePix Z30. The rubber controls--which include the only way to zoom in and out while you’re composing a shot--work fine, but they contribute to the FinePix Z30’s toylike look and feel. Pressing the Menu/OK button lets you choose from 20 scene modes; turn face detection on or off; shoot standard-definition 640-by-480 video; or flip between black-and-white, chrome, and standard-color filters. The menu buttons also let you turn on the camera’s antiblur mode (digital image stabilization), auto scene recognition, and a bare-bones manual mode that lets you tweak exposure compensation and white-balance settings. The menu navigation and modes work well, but they’re standard-issue settings for a camera priced at $200 or so. The FinePix Z30 features a 2.7-inch LCD. The FinePix Z30 captured 283 shots on a single charge of its rechargeable lithium ion battery. The FinePix Z30 uses SD and SDHC cards for storage; the card slot lies hidden behind the battery door. Fujifilm tucked a USB port under the battery door, too, so you’ll have to open the battery compartment to perform a number of options with the camera. Unfortunately, the plastic-and-metal battery door construction feels as though it could snap off rather easily in the course of extended use. Given this camera’s appearance, its image quality is a nice surprise; but the FinePix Z30 isn’t likely to sway anyone besides teenage girls due to its My Little Pony color scheme, its basic feature set, and its rubber controls. Adults in search of a capable $200 point-and-shoot with a colorful exterior are apt to prefer more traditional-looking cameras. Still, for potential buyers who fall into its target audience, the FinePix Z30 does offer good value for the price.